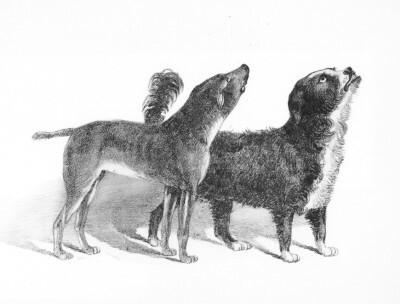 In the 1860’s, two dogs became part of San Francisco’s lore. “Bummer” was a Newfoundland dog with an overshot lower jaw who found a home at the saloon of Frederick Martin. He took to killing rats and earned his keep. He was known for his gentle manner and was well-liked among the various journalists who chronicled local interest stories in the saloons of Sand Francisco. He fed himself by wandering the streets, gently begging for food. He received his name from this habit. True to his Newfoundland form, Bummer intervened in a dog fight in 1861. He rescued a mongrel dog from the jaws of his aggressor and then helped nurse the poor beaten dog back to health. The mongrel was believed to be near death, but with the help and support of Bummer, the dog managed to return to vigor. This dog was named “Lazarus,” after the man who Jesus raised from the dead. Both of these dogs had the run of the streets. And the San Francisco journalistic community began to write about the pair, often coming up with the most bizarrely antrhopomorphic stories about them. The dogs quickly became an institution in San Francisco. So much was this true that when the dog catcher detained Lazarus, the public rallied to his defense. This outcry forced the city council to pass a resolution that exempted Bummer and Lazarus the licensing laws and gave them carte blanche to wander the streets. Life for street dogs is often short, and Lazarus met his end in a tragic way. 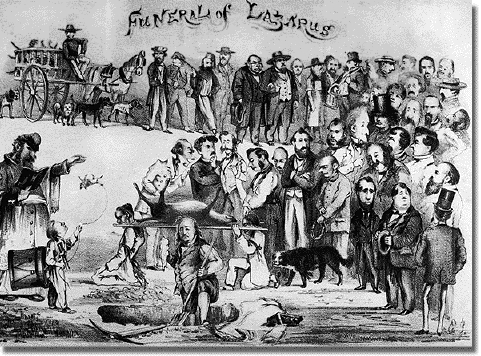 Lazarus was known for being a surly dog, and he is believed to have bitten a child. Because no animal control person would touch this dog, it is believed that he was poisoned as a reprisal. Some contemporary accounts say that he was kicked by a fire engine horse. However, it is generally accepted that he was poisoned, and a $50 award was issued for information leading to his poisoner. A major funeral was held, but Lazarus was not interred to a grave. Instead, he was taxidermied and displayed at Frederick Martin’s saloon. As the years progressed, the stories about Bummer waned. MarK Twain reported that Bummer had found a small black puppy to be his companion, but very little else was written about him. A drunk man kicked Bummer in 1865. The kick was so severe that it caused great distress to his body, and he soon died. When this man was interned at the local lock-up, his cellmate beat him after he bragged about kicking Bummer. What I find interesting about Bummer is that he’s not a giant dog. He’s a big dog. But in all depictions, he’s not the giant Newfoundland we know today. He’s also not marked in the way that Landseers are supposed to be. In fact, he looks like Landseer that has been crossed with a black Newf. He looks very similar to Custer’s Newfoundland. It’s amazing how much breeds change over the centuries.